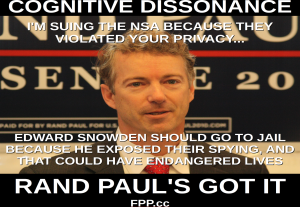 Last Summer, Rand Paul announced intentions to file a class action lawsuit against the NSA for their spying program. On January 4, 2014, former Attorney General of Virginia, Ken Cuccinelli announced on facebook that he would be joining Rand Paul in the lawsuit, “Join Rand Paul and I in asserting our right to privacy.” The irony is that anyone who signs the online petition is added to a mailing list for Rand Paul’s 2016 re-election campaign. Then on January 5, Rand Paul told George Stephanopoulos, “I don’t think Edward Snowden deserves the death penalty or life in prison, I think that’s inappropriate.” Paul added that Snowden leaked secrets “and things that could endanger lives” and suggested that Snowden “would come home for some penalty of a few years in prison which would be probably not unlike what James Clapper probably deserves for lying to Congress.” Paul further suggested that Snowden and Clapper should serve time in a prison cell together. I can not begin to fathom the cognitive dissonance that allows someone to initiate a lawsuit against the NSA for violating the privacy of millions of Americans, while simultaneously stating that the person responsible for bringing that information to light is a criminal who should be punished. It is a further act of mental gymnastics to claim that any of the information made public by Edward Snowden could have endangered lives. The US government admitted that nothing leaked by Private Manning endangered any lives, and that was information that exposed American war crimes in Iraq & Afghanistan. If nothing revealed by Private Manning endangered any lives, how could it be construed that Edward Snowden endangered lives? Exposing criminal wrongdoing by a government must never be a crime. Neither Private Manning, nor Edward Snowden, nor any other person who exposes government misdeeds should face any jail time. Private Manning should be given a full pardon, and Edward Snowden should have all of the charges against him dismissed. If anyone belongs in a jail cell, it is the people who have violated the rights of millions of people around the world, not the people who brought their crimes to light. Nailed it. I tend to look at Rand Paul as having a lot of learning about what liberty means to do before he’s as principled and consistent as his father. As for the class action lawsuit… I imagine a scenario where government settles with lawyers the plaintiffs each get a check for $19.84 and the spying on Americans continues.